I bought a new stock this week! GGP will pay out its next dividend, a $0.20 dividend, on 10/31/2016. Assuming the 3 following dividends will be $0.20, then I will receive $0.80 in dividends from GGP in a year. $0.80/$29.30 = 2.73% yield. I would prefer a 3.00% or higher yield, but this stock will eventually yield that for me if GGP raises its dividend or I buy more GGP and average down. No dividends this week. September is going to be a big dividend month though! My credit score is recovering. A house foreclosure isn't the end of the world. I have first hand experience in this. I quit a job I hated. I couldn't keep making payments on my house. Wells Fargo refused to work with me on a short sale. I let the house get foreclosed on. Honestly, had I known it was going to be so much stress of trying to work with Wells Fargo, I would have just stopped making payments and walked away from the beginning. I kept making payments on the house since I wanted to sell it before winter hit. I was worried about my house breaking down in the winter. Had I stopped making payments the month before I knew I was leaving, Wells Fargo would have taken over property management before winter hit. The bank hired a 3rd party service to winterize the house. I had no idea my house was going to sell. At the time, I did what I thought was best. Hindsight is 20/20. I could have saved myself a lot of money had I walked away from the house at the beginning. Fiscally responsible? No. But I needed to take care of my mental health at the time, and walking away from the house would have quickened my return to normalcy after a terrible year at a terrible job. If any of you are going through a foreclosure situation and want to talk about it, let me know! It's a crappy time, but it's not the end of the world as your bank or realtor might make it seem. I went to Wal-Mart this past Saturday afternoon against my better judgment. I don't like going to Wal-Mart, but it was the most convenient at the time. The aisles I needed to go to were so crowded I decided to leave without getting my stuff. I usually have a bad experience going to Wal-Mart. The parking lot is always crowded, the cars in the lot drive too fast, and the check-out lanes are long. I also feel bad contributing to a company that underpays its employees. So by my going to Wal-Mart on Saturday, I contributed to the already chaotic situation of the store. I don't mind the store in the early morning, but every other time seems like a poor life choice. Now, if you're reading this, and you or someone you know works for Wal-Mart, you might be thinking, "Hey Mitch, what gives?". I'm not trying to offend anyone for working a job, I guess I'm more talking about the overall experience of going to the store. I've been to crowded stores. I've been in parking lots where jerks drive 50 miles per hours. I've been in stores with long check out lines. It just seems that Wal-Mart is a combination of all of these negative factors. I was reflecting on my experience on Saturday and realized I was contributing to the chaos of the store. Happy 1+ year of having the Robinhood App! It has been a great tool and has saved me a lot of money! The plan is to buy stocks this week, for real this time. The money coming in and going out of my bank account has steadied a bit, so I think it's time to buy some stocks again. I received two dividends last Monday! I may come off as a broken record with saying this, but I have too many clothes. I also keep my clothes in too many locations. I have clothes in my room, dirty clothes in my bathroom hamper, and clothes near the washer and dryer. I have a lot of clothes that fit, I have a lot of clothes that don't. I have a lot of clothes that I like to wear, and a lot that are uncomfortable. Part of me says "I'll slim down and I can wear these clothes again". If I get rid of the smaller clothes, would I be accepting my heavier weight? I also have quite a few winter clothes lying around since I don't have a dedicated space to put them at. Box up clothes I'm keeping for memory's sake. Donate clothes I will truly never wear again, regardless of how much I weigh. Box up clothes for "Skinnier Mitch". Organize clothes that I consistently wear. I will report with progress later this week! I've almost had the Robinhood App for 1 year. I was so excited when they released Robinhood for Android. I downloaded the app the day it came out. I haven't been able to put as much money into it as I would have liked, but I still have a great, diversified portfolio with no commission fees. I received 1 dividend from Apple this week. I'm losing confidence that I'll complete my 2016 Mission for dividends, but I'm ok with it. I know I will make progress once I'm able to allocate more money to Robinhood. I believe I mentioned in June that my cousin had a brain tumor. They underwent surgery and the doctors were able to successfully removed 90% of the tumor. This was a scary procedure because it was a large tumor that was entwined with important nerves. I'm super glad the doctors were able to successfully remove most of the tumor. Health problems happen. I understand that. I am now currently thinking about a good friend of mine who has early stages of cancer, and has completely changed their lifestyle to try and combat it. Is this something I should be thinking about? Probably. Will I think about it more? Probably not. There seems to be conflicting evidence that using a microwave or a cell phone will give you cancer, so if that's true, there's probably not much I can do to stop the cancer. I know I can improve my health, and it's hard to do. I really don't think we (as humans) will stop cancer through exposure, but we'll stop cancer through research and medicine. There are so many bad things in the world, and I don't want to give you another negative thing to think about. I believe that statistically, someone important in your life will get cancer. With knowing this, our actions can be to live healthier lives and make memories with our loved ones. Last fall I tried to get 1 thing done per day. I just ended up with a mountain of personal things to take care of, mostly with my former house, and it felt like I'd never get caught up. At that point I attempted to just get 1 thing done per day. Currently, my checklist involves returning an item back to Amazon due to damage, faxing my insurance stuff, and cashing a check. None of these things are convenient. The return to Amazon and faxing involve a degree of uncertainty, because nothing ever goes as planned. (Faxing is archaic and stupid and I'm ranting). I got the faxing thing done today, and I will keep trying to get 1 thing done per day. It is more manageable this way, and it should help me from having to much stuff pile up on me. Ultimately, the ideal situation is to minimize these distractions in life, but it wouldn't be life without distractions. 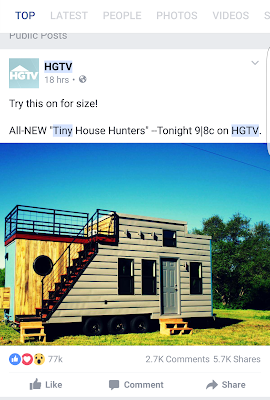 I saw an advertisement on my Facebook feed today for tiny homes on HGTV. 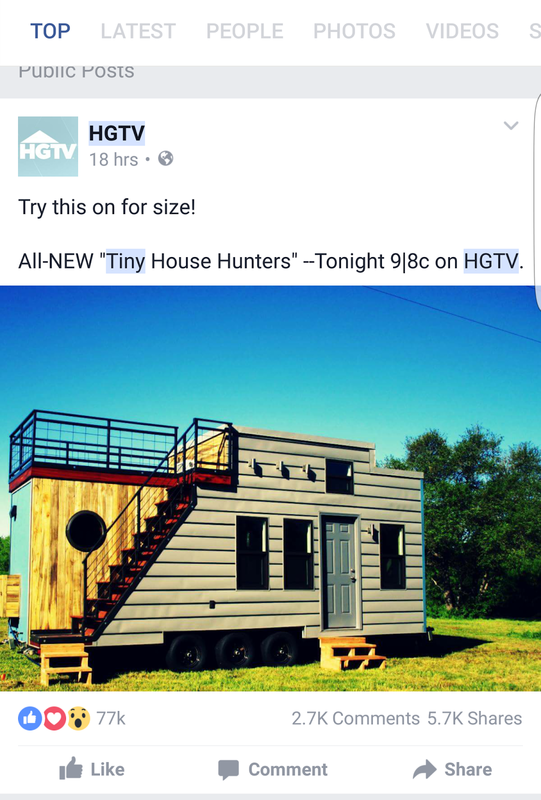 I didn't like this, and HGTV talking about tiny homes seems to go against what I would consider the "movement" of tiny homes. People who want to live in tiny homes want simple lives, less clutter, the ability to travel, and/or not having to pay a huge mortgage. A few years ago I was SUPER interested in tiny homes. I really, really wanted one. I wanted the small space, the cheapness, and a place to myself (this is when I was living with a roommate). HGTV has tons of shows with expensive and large houses that make people feel like their homes aren't good enough or adequate. It seems odd that now HGTV is talking about tiny homes, but I guess they have to stay current with what is popular. Yes, I am on my soapbox right now. No, I have never seen the show. I don't want to watch the show. I loved researching tiny homes because it felt like an exclusive community of people breaking free from the constraints of having an expensive home. Now that HGTV is talking about it, it doesn't feel is exclusive. Minimalism - I've been doing better on keeping my kitchen de-cluttered. I've been making it a rule to leave no dishes at my table, and also to have 1 side of my sink completely empty. Yea, I'm lazy, and I'll let some dishes stack up, but I'm working on this. Investing - I'm looking at GGP stock, General Growth Properties. I may look at buying this in the future. I'm also reinvigorating my interest in credit unions. I really can't deal with the limited hours of banks, and I know sometimes credit unions have extended hours. Technology - No major updates here, still loving my phone and the unlimited data. Conservation - I'll be buying some more efficient light bulbs soon. Health - Walked over 20,000 steps today. I'm going to try and finish 3rd or better in my Fitbit work challenge this week! I've been in the same apartment and job for 1 year now, and it feels amazing. In a time when a lot of my friends are exploring the world, getting married, and having kids, I'm not. The best part is that there is nothing, or no one, that is dictating how long I stay here. I could and can leave whenever I want. I know I don't have control over everything in my life, but I do have control over my job, and that is an amazing feeling. For some context, my last job as an engineer, I had signed a contract saying if I left before 1 year of work, I'd owe back the moving expenses the company paid to move me. This TRAPPED me to that job. When I say I have "control" over my job, I don't mean complete control. I don't control if I get fired. BUT, I am in a great position to move on if I do. (Don't worry, I don't sense that I'm in trouble of being fired or anything). I like the stability of where I am at right now. I haven't had any consistency of living or work for a long time now, and it's super nice. Don't get beat down by seeing friends getting married, popping out kids, or going on trips around the world. If you're not doing those things, you're tackling problems now that you won't have to in the future. We're getting just as much life experience by learning to deal with problems now that all of those other people will face in the future. My Robinhood portfolio is over $100 higher since my last investing update, and I haven't added any new money out of my pocket either. BUT, I don't anticipate this will last too long, as I'm sure towards the end of August stocks will go back down. What do I base this thought off of? Just my experience over the last couple of years, no solid research or anything, so DO NOT trust me on this. Just a prediction. Here are all of the dividends I received since my last investing update! $4.58 in total. Averaging $0.80/week in dividends right now. I think this is cool! No new stocks this week, or since my last investing update! All right, I need to start getting serious about this Investing Mission. Expect to see some new stocks soon! I really miss reading a blog called Dividend Mantra. I'm not going to link the website, because I don't think it's worth going to anymore. It used to be a blog/site by a guy named Jason. For the last two months of Jason regularly posting, I was checking his site every day for a new post. I was looking forward to reading his posts for years to come and reading about his stocks, dividend payments, and how he was moving closer to having his dividends cover his cost of living. I don't know exactly what happened to the blog, but he sold the blog to some dudes, and now the blog (in my mind) is dead. I went from checking the blog every day to now only checking in once every 2 months. I don't even really know why I check it, maybe just to reconfirm that the site I knew is really gone. I haven't found a site to replace reading his. I more or less have filled it with watching Casey Neistat's video blogs every day on YouTube. Interests come and go, and reading Dividend Mantra wasn't something I was planning on giving up on anytime soon. I miss your blog, Jason. I got a Fitbit a few weeks ago. I had heard about using a Fitbit a lot from Tim over at steppersstory.com, but I never got my own. After playing Pokemon Go with some friends, I decided to get a Fitbit. And actually, after getting the Fitbit, I've been more focused on getting steps than playing Pokemon. I'm in my second work-week challenge, and this second week's challenge is more fun than last week's. Last week we had some super competitive people, so it wasn't really fun trying to get steps in. I think I'll need to work on finding the right people to "surround" myself in for the Fitbit step challenges. The battery life on my Fitbit has been great (I have the Fitbit One). I've only charged it once in the past two weeks, and even then the batter was only down 1/3rd of the way. It's a great piece of technology and now I need to get consistent on getting 10,000 steps in per day! I've been saying for awhile that Facebook was going to make something like Snapchat, but I thought it would be built into their Messenger App. Facebook's response to Snapchat, at least part of their response as I don't think this will be everything, is now built into Instagram. We can now post picture/video stories on Instagram. I first noticed this when looking at the trends on Twitter and saw #InstagramStories. It took me a second to figure out how to post a story on Instagram, but it's the plus sign button in the top left corner of the screen. Just like Snapchat, you can see who's looked at your story. I'll be interested to see how many of my friends start posting stories to Instagram. I'm not going to make public predictions on what I think will happen after this, but I will be interested to see if Snapchat responds to this. It'll also be interesting to see if this affects Snapchats IPO (initial public offering), whenever that happens. I've had my new phone for a couple of months now, and I love it. I love the large screen, the long battery life, and 32 GB of storage seems huge compared to 16 GB. I am noticing that my phone is slowing down a little bit, and I think it's due to pictures/videos saved to my phone. I save quite a few of my snapchats, so I may need to transfer those to Google Photos and delete them directly off my phone. I've never really believed in using an app to maintain my phone. Like I've said before, if you download apps directly from the Google Play Store or the App Store, you should be fine. I don't use the edge part of the phone at all. I'm not even exaggerating. Again, I got the Edge only because it had a larger battery than the regular Galaxy S7. One thing I find annoying is that when I do a video snap, the beginning of my videos are noisy from the microphone picking up my fingers pressing the phone. I guess it's good that the microphone works, but creates some unnecessary noise on Snapchat videos. Those are a few updates on my phone!